It’s quiet here when we arrive. We walk up the small hill toward the picnic tables with our Thai tea and sandwiches from The Saigon Deli. I never noticed before how this park has a terraced, rolling landscape that adds such dimension. Thousands of lawn daisies are catching the evening light and the wind rustles the maple leaves gently. We find a table near the fountains and dive into our sandwiches. A couple rides through the fountain on their bikes, splashing and laughing and a little beige boy runs through in his diaper squealing with glee. Bus 27 whirs by on Yesler. I see people on the other side of the street sitting on their steps and watching the day go by just as we are doing. There’s a texture here that I love. It’s soft, diffuse and kind of chill. I note that I don’t see anyone at the park here looking into their cell phone screens. People here seem content to just be. 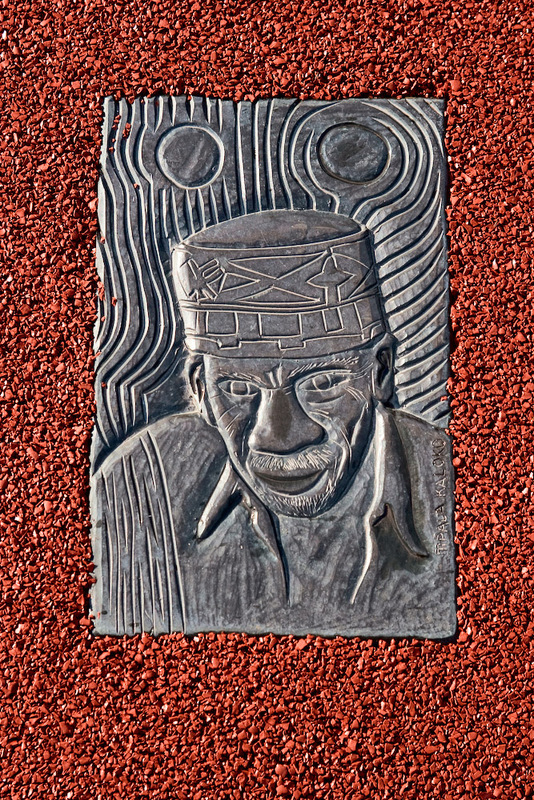 I’ve learned that this lovely, vibrant park, nestled in Seattle’s Central District between Yesler and Jackson, was purchased by the City in 1958 and became the site for a park and low-income housing project in 1966. 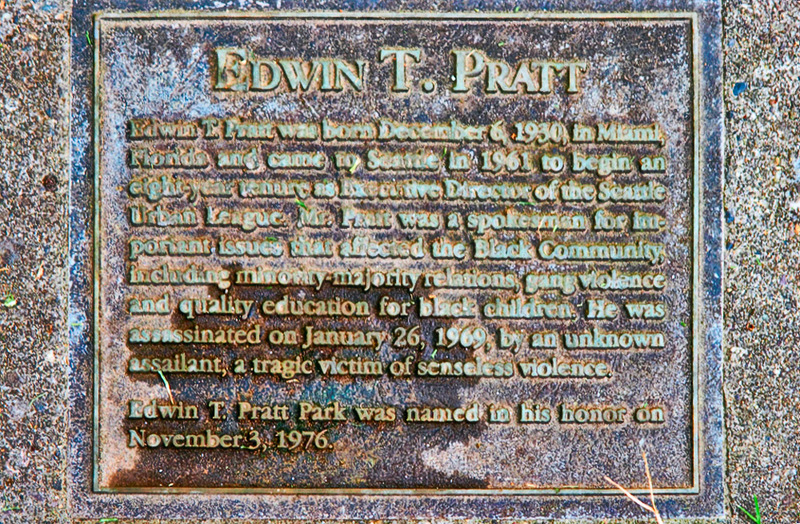 It was named after civil-rights activist Edwin T. Pratt in 1976, seven years after his assassination. Pratt was a community leader and a founder of the Central Area Motivation Program (C.A.M.P.). Although I have been to this park many times with my children watching them play in the fountain and dangle from the dome-like monkey bars, I didn’t know much about his legacy until I did the research for this article. I have, however benefitted from it not just as an admirer of this park or as a mom whose children go to desegregated schools thanks to his efforts but also as woman in need. As a new mother, I volunteered at C.A.M.P.’s food bank. In more recent and leaner years, I was the recipient of their services. I find myself feeling grateful both for his vision and for whoever was responsible for making sure his name lives on here today. And what a beautiful legacy it is! The slow, gentle pace here is sprinkled with squeals of playful children and long, laughter-filled conversations. Several art installations add color and life to the landscape. 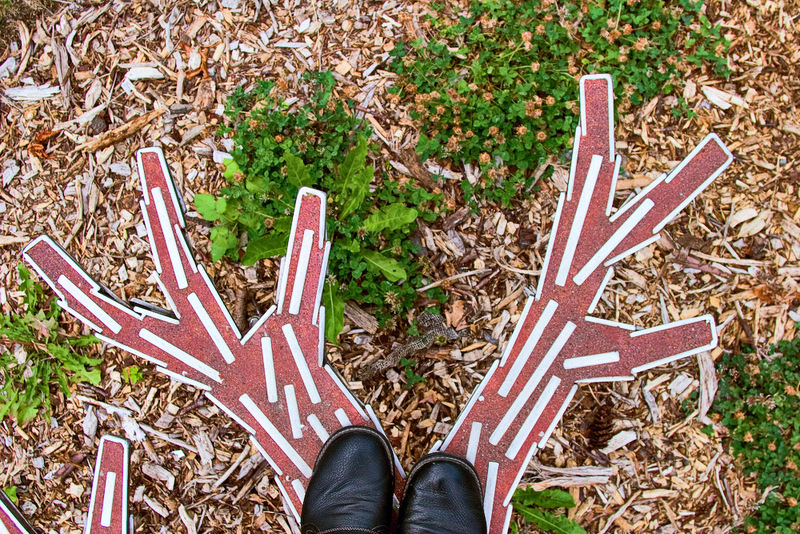 To the north, is Tree Bench by Seattle artist Paul Sorey, installed in 2006. It’s the kind of art I like—the kind that can be climbed on (so I did). To the south, you’ll find Pratt Fine Arts Center where you see the sparks from welding, fabulous mural art and where I’ve had the good-fortune of taking classes from local artists like Larry Calkins. In the center of the park you’ll find creatures spitting water at delighted children. 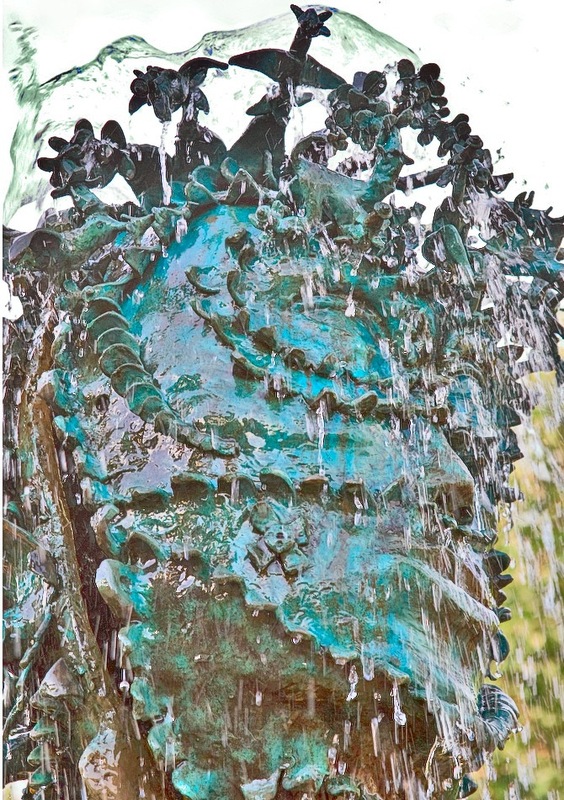 This fountain, installed in 1995, is dedicated to the memory of Dr. Blanche Lavizzo, the first woman African-American pediatrician in the State of Washington. The African-themed art installation was created by six different artists and is filled with goddesses, spirals and other creations. As I snap pictures of them and look closely, I remember coming here many summers ago and doing rubbings of these images with crayons. I think of all the bare feet that have walked on them and how those feet travel to other places carrying the spirit memory of this gentle place with them. I think of this line from the Langston Hughes poem, Feet Live Their Own Life, “Everything I do is connected up with my past life,” and my heart smiles with recognition of this deep truth. I notice as I leave that a few of the maples leaves have already fallen and dried up. As I watch three elders chatting with each other on a bench and taking time to just be together and gather their thoughts before they speak, I realize that this is the kind of place you come to when you’re not afraid to watch the passing of the seasons.